In our last Reporting Services article we used the ListChildren method to display a tree list of reports available to a user. In this article we will tackle the CreateSubscription method, which requires substantially more code to get running. There are more parameters to pass, and the parameter types are more complex. In addition, the extensibility of Reporting Services means you’ll need to dig a little harder to come out with the correct incantation for the delivery provider parameters. This article assumes a web reference to the Reporting Services Web API exists. If you need assistance setting up the reference refer to the text and resources in the previous article. CreateSubscription points to a single report in the report server database. 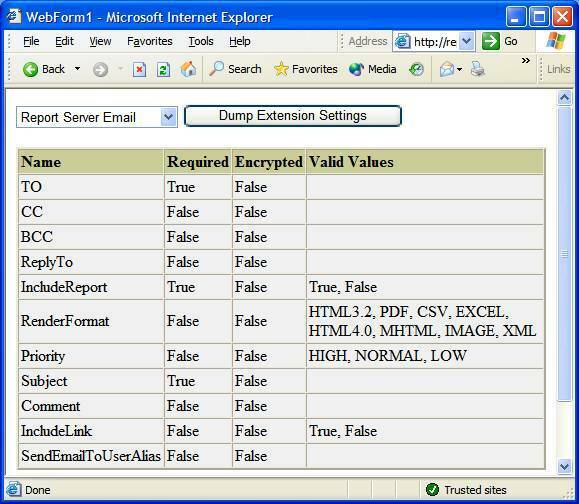 The report server will execute and then deliver the report based on settings you provide. Delivery mechanisms shipped with the RTM version include e-mail delivery, and file share delivery. Let’s take a look at the CreateSubscription method and walk through creating each parameter. The first parameter is an easy: just pass the full path and report name for the report you want to subscribe to, i.e. Likewise, the Description parameter is just a string to describe the report subscription. The rest of the parameters we cover, however, are not as trivial. Reporting Services ships with two delivery extensions: file share and email. You can view available delivery extensions when you click on “New Subscription” in the Reporting Service GUI, or in the RSReportServer.config file where you installed the web portion of the report server. Each delivery extension will require a set of name-value pairs as parameters. Some parameters are required, others are optional. It is possible to uncover the exact parameters required by each extension programmatically using the web service method GettExtensionSettings.
. After retrieving the list of required and optional parameters you could dynamically build a form for a user to fill in the details. In our sample web form, we will just build a table to dump out the parameter list for a delivery extension. The delivery email extension should produce the following table of values. To see how to put these to use, let’s take a look at the method to setup the extension parameters for creating a file share delivery. In the above code, the username and password for the delivery extension are the credentials the server will use to access the network resource. You can find documentation on the rest of the parameters in the Reporting Services books online under Reporting Services Delivery Extension Settings. These two parameters work in conjunction to define when the subscription event will trigger. For EventType the possible values are “TimedSubscription” and “SnapshotUpdated”. A timed subscription runs on a schedule, while a snapshot updated report will deliver a new copy of the report whenever the report runs an execution snapshot. The contents of the MatchData parameter entirely depend on the EventType parameters. For SnapshotUpdated subscriptions the value will be null (empty). For timed subscriptions the contents of MatchData will contain an XML representation of a ScheduleDefinition object (unless you are using a shared schedule, in which case you can pass just the ID of the shared schedule). In our example we will setup a timed subscription. Let’s take a look at a top level method used to create the XML string we will pass to the web service. The object you pick will depend on the timing of the subscription (does the subscription need to deliver the report every day, or once a month?). In this example, let’s build a schedule to deliver our report on the last Friday of every third month. The following method uses an XmlSerializer object to create the XML. Notice we need to massage the WhichWeek element. This is due to a bug in the RTM version of reporting services and will probably not be needed after a future release or update. The final parameter to CreateSubscription is a list of parameters specific to the report you are subscribing to. Since the report we are subscribing to does not require parameters we can pass an empty value. This article will hopefully be an aid to anyone starting with the CreateSubscription web service API call. If you have any comments or questions, please contact the author or post a comment. For more tips on Reporting Services, see these addtional articles on OdeToCode.